Bullying Topic Card Set Now Available! This innovative, ground-breaking game encourages young people to open up and gently begin first conversations around sensitive topics. The game is intended to be used with a professional or support person who the child feels comfortable with, such as a social worker, family support worker, teacher, psychologist, or counsellor. The game comes with detailed instructions and notes about how best to use it safely and effectively with a young person. 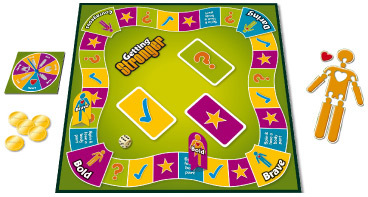 Getting Stronger is designed to be played with any of the topic cards available in the Getting Stronger Topic Series. This means the game can be used for a wide range of difficult life topics just by using different card sets. In this way, it can be easily tailored to the unique needs of young clients, either individually or as a group. New topics will be added regularly, including; bullying, living with learning disabilities, when a family member’s in prison and when a family member has a brain injury. takes 20 - 30 minutes and can be replayed several times, with plenty of questions.